In a recent blog I introduced you to the rotating panoramic camera, a complex mechanical device dating from the early 20th century. The heart of that camera is the roll of film, moving at a constant speed through the camera, combined with the rotation of the camera at a sped which is perfectly timed to match the speed of the film. That’s a complex mathematical problem because the film speed is a constant, but the rotational speed is changed by putting gears of different sizes on the drive motor, making the camera turn faster or slower. The speed of the rotation is a function of the focal length of the lens and the distance-to-subject of the image. A long lens would require that the camera turn quickly while a shorter lens would require that the camera turn more slowly. But what if you don’t turn the camera? This is a photo-finish image of a horserace taken in October, 1953. 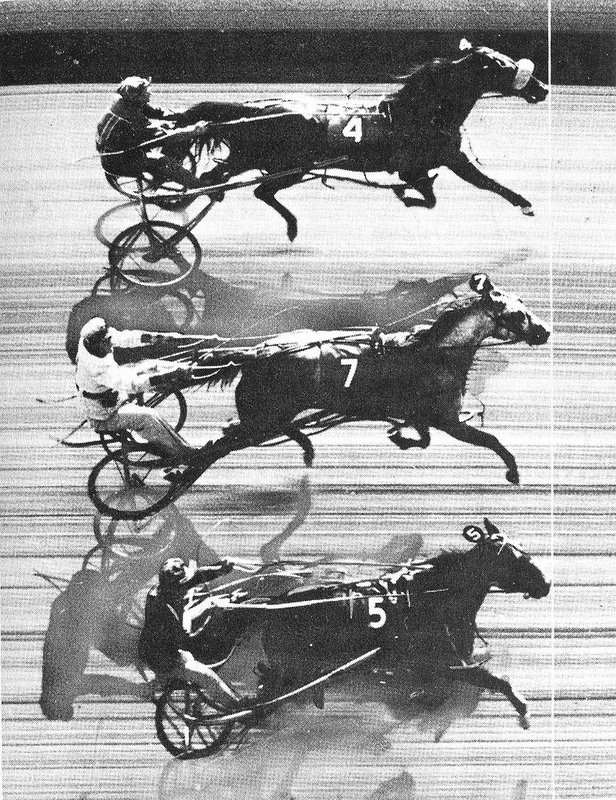 It was the first triple dead-heat in harness racing: Patchover (Ed Myer), Payne Hall (F. Albertson) and Penny Maid (E. Beede) in a Freehold Raceway (USA) Race 3. Photographer unknown, from the Gooreen collection (acquired from Wikipedia). The white line on the image was drawn with a pen after the film was processed to indicate the position of the finish line. The inventor was an employee of Paramount Studios, one Lorenzo del Riccio, who did exactly that. He put a camera at the finish line of the Del Mar track near San Diego, California, and ran film through the camera as the horses crossed the line. What he did that day was the beginning of the scientific measurement of time using a camera. Time was marked on the film as it moved past the slit, and then whatever passed in front of the camera was recorded accurately onto the film. Anything that stood still was recorded as a streak of lines. Whenever there was a race too close to call, the race officials would post the word “PHOTO” on the race results board while technicians would unload the film from the camera, run to a darkroom below the bleachers of the track and process the film. When the film was processed, the judges would view the film and determine the winner. The photo finish remains to this day a most accurate way to determine the winner of horse races (and bicycle races, etc.). Modern photo-finish cameras are digital, and they are very fancy and expensive. But, except for the film and the processing, they do exactly the same thing that their predecessors did. Anything that moves in front of the camera is recorded accurately while anything that does not move is recorded as a stripe. This is an image I made using my home-built 35mm slit-scan camera in 1980. I used the image on a poster for my typography business that year. It remains one of my favorite images. In 1980 I built a photo-finish camera. I took a Nikon F 35mm still camera and I glued a slit into the aperture area. I had made the slit by photographing an accurately cut thin line (made with a gelatine product called Rubylith) onto a piece of orthochromatic film in a process camera. The aperture was about 0.003 in. wide. Then I put a small electric motor on the rewind knob shaft of the Nikon. I named the camera Rumpleslitscan. To make photo-finish images I would pre-wind an entire roll fo film into the camera, then I would go outside to photograph an event, and set the focus and aperture on the lens. Then, with the shutter open, I would attach a battery to the electric motor and wind the film back into the film cartridge inside the camera, resulting in a slit-scan photo-finish image. It worked quite well. 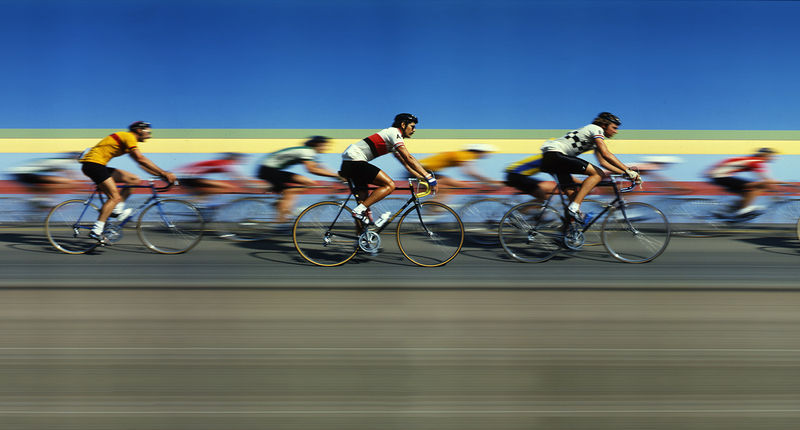 My ultimate objective was to photograph a bicycle race – an entire bicycle race – on one roll of Ektachrome film. After some experimentation with voltages and resulting film speed, I made a chart of estimated real speed converted to film speed, which I correlated to voltage. If I could guess at the correct approaching speed of my subject, then I could look up the speed on my chart and set the voltage to match the action and get a reasonable image on the film. Here is an image I made with a second slit-scan camera I built. It used larger film and a bigger lens. The blurred images in the background are a result of a shallow depth-of-field setting, which created a very nice visual effect. For power I used not-quite expended Polaroid film batteries. Each battery was just under 1.5 volts, and I could stack these batteries in series to change the voltage. It took only a minute or so to change the voltage and be ready for my exposure. I experimented a lot using black and white film (which I could process myself) to get exposures and battery settings correct. Then I went out to make the final images. This is a section of the larger bike race image I did with Rumpleslitscan (shown complete below). It shows the amount of detail possible in an image like this. One of the images ended up on a poster for my company – Tintype Graphic Arts. I still have the original film from that set-up, and I have enjoyed scanning those images recently. They are pretty amazing considering the state of technology I was using. This is the largest group I was able to capture at the bike race that day: 67 riders and a Volkswagen bus “sag-wagon” following with spare wheels and water bottles. In recent years we have seen panoramic photography move from slit-scan, rotating camera technology to stepped rotating cameras and stitching software (more on this will be coming in a future blog). The results of this technique are very satisfactory (You can read about my most recent stitched GigaPan image in this blog). But, what about slit-scan digital imagery? Is it possible? Yes, it’s possible, and it’s easy, thanks to several free iPhone apps (there may be some for Android also). The idea is the same as a photo-finish camera using film. You scan only one column of pixels in the center of the scene, and you record the image made by passing those one-column scans to a file. And, as with the film technique, whatever moves in front of the camera is recorded faithfully while anything that stands still is recorded as stripes in the image. For the past few months I have been living in an apartment next to the train station in central Munich. Every time I go outside I see trains coming and going on the tracks leading to the Hauptbahnhof. I have been taking my iPhone out to photograph those trains recently, and getting some very nice (and sometimes very odd) images. It’s heaven for me and my modern photo-finish camera. For this I use a MeFoto tripod bracket to hold the iPhone, and a regular tripod. I station myself at the station and photograph passing trains, passing people, anything that moves. I consider it research in time and motion. This is a regional Meridian train arriving at the Hauptbahnhof in Munich. It was traveling at a relatively slow and constant speed. That made the compression consistent. This is the same image distorted closer to reality, but still compressed. The results are very interesting. I can compress the length of a Munich Meridian train from 500 feet to about 100 just by capturing the train as it enters the station. Curiously, slowing trains or trains that are accelerating distort themselves (remember that the slit-scan captures columns of pixels at a constant rate of speed). Getting a train that is going at a constant speed is fairly difficult, but I have captured a few. I made this image at a pizzeria in Rothenburg, Germany. People were just walking by, except the waitress, who walked into a doorway directly in front of the camera, and turned as she did. The people with the “skid” feet were walking right-to-left; the people with tiny feet were walking the other direction. All of the people were recorded in left-to-right direction by the slit-scan camera. Here’s the fun part: Regardless of the direction of the train, the image recorded to the file always goes left to right. So if I record a train that is entering my scene from the right, or a train entering from my left, the images of those trains will always go from the left to the right. Lettering on the trains is mirrored when they come in from the right (in fact the entire train is mirrored). I discovered this strange phenomenon back in the 1980s with my home-built slit-scan camera. Whether the bicycles rode right-to-left or vice versa, their image was always recorded in the direction of the film. With digital it’s the same. To grasp this mysterious concept, think about the fact that the camera is recording just one vertical column of pixels, then storing it in a stack left to right. The camera does not know or care where the image comes from; it simply records whatever is in front of the lens at the moment it records the column of pixels. It writes the columns of pixels to the growing file, then it does it again, and again…. 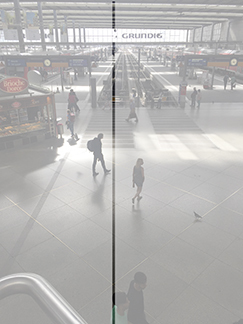 This is a time-and-motion study I did this week at the Hauptbahnhof in Munich. Notice that everyone is moving left-to-right. Since the light is coming from the top, their shadows are all cast the same. But people with “skid” feet were moving from left-to-right. This is a photo-finish image made with a digital camera. In a study I did this week, I photographed people walking randomly in front of my camera from a second floor balcony at the Hauptbahnhof. No matter what direction they came into the scene, they are all walking from left to right in the resulting image! The camera turns some of the people around, and leaves the others alone, traveling in the original direction. This is a regular photo, taken at the exact location of the slit-scan image above. I have highlighted the “slit” that is recorded by the software, making these odd and interesting images. Only things that move through the slit are recorded as images; the building itself is recorded as a set of stripes. So, as moving things enter from the right, the pixels are “unwound” as they are recorded, and as moving things enter from the left, they, too are “unwound” – but in the same direction they were traveling. It makes no difference to the slit-scan camera. One thing that is even more curious is that the shadows cast by moving objects are recorded in the correct direction. Shadows cast in advance of moving things are recorded before the object enters the column, and following shadow will be recorded after the moving thing enters the column. As a result, it’s common to get images of moving things with shadows going in opposing directions. Once you get over that concept you can really begin to appreciate the strange and delightful world of slit-scan photography. This entry was posted in Art, Gadgets, Panoramic Photography, People, Photography, Photoshop techniques, Scanning, Software, Technology and tagged bike race photography, Brian Lawler, Panoramic photography, photo-finish, photo-finish photography, race cameras, slit-scan photography. Bookmark the permalink. I just discovered your amazing blog while looking for some info on slit scan cameras. I’ve been working with mine for about 10 years and I’ve never been able to eliminate the vertical banding that occurs. Thank you for your post on my blog. I have looked at your interesting and amazing slit-scan images. Congratulations on some very nice work, and some very clever cameras!